Each year during the third weekend in November, the City of Norfolk holds its Grand Illumination Parade, which kicks of the holiday season in the city. The culminating event is the illumination of the Norfolk downtown skyline. 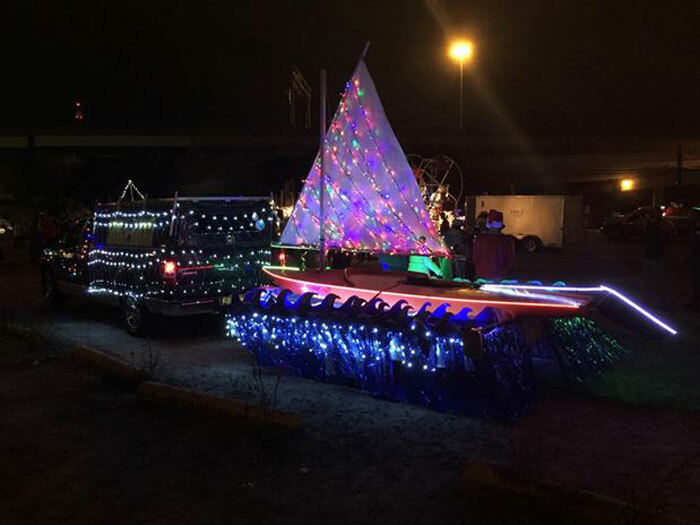 The parade features spectacular floats, marching bands, giant balloons, dancers, Santa himself, and one very special float, the Broad Bay Sailing Association/Hampton Roads Sunfish Challenge (BBSA/SC) holiday float. 2017 was the second year that the BBSA/SC entered a float into the parade. The float features area sailors from many different sailing clubs and organizations decked out in holiday garb, highlighted by a float with a Sunfish sailboat cresting the waves, studded with over 4000 colorful holiday lights. Many months and weeks of hard work go into the design and building of the unique float entry with many folks lending a hand during the buildout. Ullman Sails of Virginia graciously built a scaled down version of the lateen rigged Sunfish sail, and Gary Herbert of Langley Yacht Club (LYC) donated a “gently” used Sunfish hull. Members from LYC, Old Point Comfort Yacht Club, Hampton Yacht Club, BBSA, and the Sunfish Challenge all lent a hand to make this float the class of the parade. Jean and Jerry Pattenaude with BBSA, honchoed the buildout effort this year, coordinating all aspects of the float assembly. 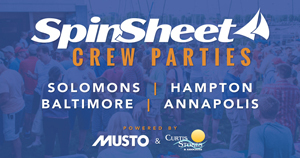 They noted that this was truly a concerted Hampton Roads sailing effort. As with last year, around 15 folks marched with the parade, waving and handing out goodies to the enthusiastic crowd, but one marcher stood out above the rest, Margaret Miller. Margaret, a first time marcher, reveled in the essence of the season, and was inspired by the spirit of the parade crowds. She felt inspired enough to provide a short write up that follows. The parade was just one part of a larger Grand Illumination weekend, with the Grand Illumination Cruise going on simultaneously. Many skippers from several clubs sailed from their home ports to rendezvous at Waterside marina in Norfolk to watch the parade and enjoy warm cider and other hot libations. With the weekend forecast calling for winds in the 20-30 knot range, it was unforeseen that this cruise would fill up the Waterside marina’s 38 slips. After the parade, what started as a party of the Pattenaude’s catamaran, Shangri-La, quickly escalated, or de-escalated, into a “boat crawl”, with participants all eating, drinking, and being merry. At one point Jean counted over 20 folks on her boat, enjoying the company of fellow sailors. Place it on your calendar now, the third Saturday in November for next year’s Grand Illumination Parade cruise. See you there! They say that parades are for the “Young and the Young at Heart.” I had the opportunity to participate with Ken Damon in the combined HYC, OPCYC, and BBSA Grand Illumination Cruise to Norfolk this year. The Grand Illumination Parade in downtown Norfolk was exhilarating for me, a young at heart 66 year-old grandmother. I have always found extreme delight watching a parade flow by, as I tapped my foot to the lively beat of the bands. But now I can brag that I was a part of my favorite holiday tradition. 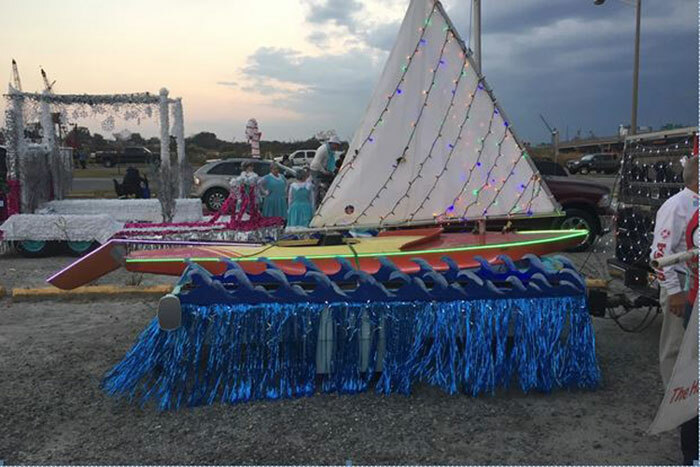 We spent much time prior to the parade start, decorating the BBSA/Sunfish Challenge “Sunfish Float” with festive flashing lights, and draped her with ocean blue fringe to create splashing waves. At the start of the parade I eagerly anticipated marching with the float as she navigated through thousands of happy holiday onlookers. As I walked the route, the energy radiating from the crowd was enough to float any boat to a safe harbor. Thanks to a wonderful group of people from BBSA/SC, Hampton Roads Sunfish Challenge and Dinghy Distance Race, HYC, and others. I am overjoyed to say that there are no barnacles on this Granny’s bow!